I e.g. use Babylon Pro and by pointing my cursor on a Greeklish word it comes up with nothing. My request for those who use greek words in their messages is to include the english translation of the word in brackets, so people who have no knowledge of the Greek language, will be able to read and understand what you say. Otherwise, your message will be of value only to a very small number of Greek-speaking members. i only have the english language on my computer, so i cant write in greek letters even if i wanted to. also i feel if i use greek words that other people are not familiar with, if they are really interested they ask what it means. ��� ��� ������ ���� �������� ��� ��� �������� ���� ��� ��� ������ ��. On the task bar you can probably see a keyboard and a syntax for the language you're using. When you right click on it you can change the language settings. I am sure that, what you have written in Greek in the message above was meant to be a joke, but I am afraid no one will be able to read it. Not all PCs are the same, and Mavrolio, as well as other members, may use the computers at work, where it is not allowed to activate extra languages or do other changes. Besides, how much are you going to improve your Greek, by a few greek words in the messages on this forum? If you want to practice your Greek, you can do that in the KPHTH forum, which is for Greek-speaking members. The text I wrote was not in Greek but in English using the Greek character settings for my keyboard. It was merely to show Mavriolio how easy it is to change between the both. You should really try it your self. If you change the Greek characters into the English ones you can read what I wrote in Greek characters to Mavrolio in my posting. There is none language installed on PCs as you know of course. The language is written by the keyboard using characters to form words The only thing that can differ are the languages of the operating system for countries where English has not become a second language. ��� ;���� ����� ��� ����� ���� ��� ���� ���. It doesn't change any thing with the PC settings. It is a normal procedure Windows XP offers to write letters in more languages than your own. Even Chinese.....In Holland we wouldn't be able to communicate if we could only use the English character settings of the keyboard. Only trouble is that you have to find out on an English keyboard if the Greek characters and punctuation marks are in the same place. (which also counts for e.g. German and French) But there are overlays for the keyboard one can use. I know there is a Greek page on the forum. I use it as a study page. What I mean with my question about using Greeklish is that e.g., the signing from Mavrovolio is hard to translate since Greek character combinations are not shown (amongst others.) Of course you will not learn any Greek from the (other) Forum topics. Thank you for the reference to Babylon Pro! My wife is a high school teacher here in Texas and thinks this site will be helpful to her. Another reminder/request to our forum members to write in the Greek characters and not in Greeklish please. I, and I think other forum members who try to learn Greek as well would appreciate it. BTW Yannis is there a reason why Greek characters are converted in those funny characters with the question mark? Using your Greek keyboard doesn't help me - all I see in your messages are little square boxes and I'm blowed if I'm going to waste time trying to work out how to read them properly. As this is a mainly English speaking board, I see no reason for it - especially considering how many non registered viewers look at this site. That remark of the square boxes was my in my pm as you can see. Every so now and than members like to write some wishes in Greek and in my opinion there's nothing wrong with that for after all this is a forum about Crete and not about England. However my point is that if you do, do it in Greek characters. Point. This board mainly consists of English speaking members which has also to do with the fact that English has almost become the international internet lingo. A pity for the ones who only speak their mother tongue. Which still leaves me with the question why is Greeklish allowed and Greek characters changed to question marks. I would rather prefer it the other way around or both turned into question marks. That would at least make sense. 3) use latin characters as in ISO 843 (like in greek road indications .. in the past, after they changed a littlebit) es. "egò agapào tin Krìti"
What exactly you mean for "greeklish"? may be 3) or 4)? Is it possible to add the Symbol fonts set on the board editor? Install GREEK-language to your PC and switch between the 2 or more languages. In the taskline you can see always which language is in use in the moment. Greeklish is Greek in Latin characters. (Greek from Greek and lish from English) This is only interesting if you speak/write Greek fluently. If you don't, and if you are trying (or wanting to) learn Greek, you can't translate the Greeklish written word using e.g. an on-line dictionary like Babylon or a common dictionary. Because there is no Greeklish dictionary. Replacing the Greeklish characters by the Greek ones makes it rather complicated I think. So that's why I try to communicate to use the Greek characters when ever you want to express yourself in Greek on this forum. Eg. Happy; birthday, death, eastern, Christmas etc. what ever you like. But there is a problem using the original Greek characters because they are reset to question marks in a black tilted square in this forum. Now we have come to a Catch 22 situation. No? Mind you of course this is no place to learn Greek. I'd advise to do so back home by taking courses etc etc. That's for the Greeklish part where this topic was about. Somewhere else in the plethora of topics on this forum I explained how you can set your pc or laptop to produce Greek characters by using your standard European keyboard. After the setting of the required language(s), as you stated, you can toggle between every language you want by using shift-alt. 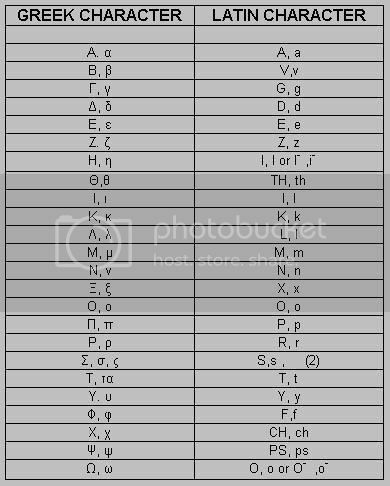 The next problem that occurs is the fact that the the European and the Greek keyboard have different character settings. This is how the Greek keyboard looks like. There are also little stickers or covers to mark the Greek keys, you can find them on the internet as well. There is a topic on the forum by Yanni where you can freely express yourself in Greek. But I'm afraid I feel a bit feeble to do so (yet). Still, if you feel the need to express your self in real Greek I'd advise to do so in Yanni's topic so we can all learn from it and hence acquire a bit or more routine in this for the most of us interesting but hard to learn beautiful language. For this reason I was looking for a different solution more "compatible". Thanks Katarina, that's excactly what I mean. I meant just this thing, saying "full use of greec" in my message over. The only problem is for some Forum boards that not allow Greec Characters anyway (also with ISO or Greec in View), or in systems (like for example Terminal Server in work environs) where setting Greec Lenguage is not easy or possible as in PCs. In these cases could be useful an "alternative way" also with limitations.